Set your table with Elegance! Enjoy our new line of premium designed plastic plates with a pebbled edge. Available in 10.25", 9", 7.5" plates and bowls as well. We also have coordinating tumblers and wine goblets. Pebbled Collection 10 1/4" Clear Banquet Plates with Pebbled Border 10ct. 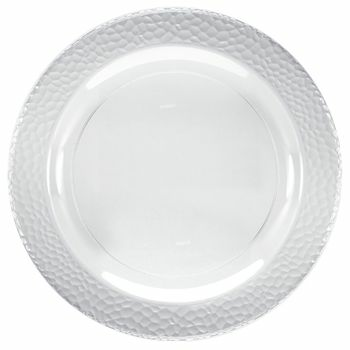 Pebbled Collection 9" Clear Luncheon Plates with Pebbled Border 10ct. Pebbled Collection 7.5" Clear Salad/Dessert Plates with Pebbled Border 10ct. Pebbled Collection 14oz. Clear Soup Bowls with Pebbled Border 10ct. Pebbled Collection 5oz. Clear Dessert Bowls with Pebbled Border 10ct. Pebbled Collection 7oz. Clear Oval Bowls with Pebbled Border 10ct. Pebbled Collection 32oz. Clear Oval Bowls with Pebbled Border 3ct. Hammered Effect Plastic Silver Forks 20ct. Hammered Effect Plastic Silver Knives 20ct. Hammered Effect Plastic Silver Teaspoons 20ct. Hammered Effect Plastic Silver Soup Spoons 20ct.